Just curious, let's say Edward VIII had been allowed to marry Wallis Simpson and keep the throne. They then had issue and their child or grandchild now sat on the throne, which of course would make the person we now call Elizabeth II just a royal cousin. Would anyone care to speculate on what arms, if any, Elizabeth would have been granted before Her marriage. Now, let's say Elizabeth still married the man we now call Prince Philip, keeping in mind Elizabeth is still just a royal cousin. What arms then? Please remember this is just an exercise in heraldry and nothing more. Re: What if Edward VIII ? My guess would be, the same charged label as her father but with five pendants (dangling thingies) instead of three, and as oldest likely merely repeating the same charges on the extra pendants. Since I don't recall (if I ever knew) what charge(s( were on her father's label, that's ad specific (or specifically ambiguous) as I can be. As to Prince Phillip (was he a Danish or Greek Prince?) one could only hope for a simplification of his own arms similar to what actually occurred, though likely without the quartering for Edinburgh if that only came after ER II became queen (again, faulty recall). If "Edward VIII" and his wife had had a child it would have probably been introduced into the bedroom in a warming pan. Firstly, they didn't have a child as Duke and Duchess of York, and secondly, Wallis was rumoured to be infertile as a result of a botched abortion. Last edited by Chris Green on Mon Dec 12, 2016 7:14 pm, edited 1 time in total. OK Mr. Green, if you see the last line in my post this was just an exercise. Actually I'm lazy and it's easier to ask a question here than do the research myself and I'm aware of the lives of Prince James Stuart and Wallis Simpson. Getting past that, the rest of your answer was good. It's about 11:00 am Sat. here in Buckingham and since I wasn't satisfied with Mr. McCartney's answer I spent about 2 hours researching royal cousins this morning. I now have a pretty good handle on it, but it's still easier to just ask a question and come back to it later. It bothers me that they don't allow a husband who bears arms a tiny little corner on his royal wives arms, they can always change it, the arms of Prince Philip being a example of change, the King didn't like the 1st. British arms created for Him and just said change them. I guess it's just part of the " privilege" of marrying a royal. Does a royal even wear a wedding ring? Oh no, now I'm off to look for royal left hands. Thanks for your input. Oh, by the way does anyone have a really good handle on Latin out there. If so there's a few paragraphs in the visitations I would like to see translated. I tried Google translator, but with the abbreviations it doesn't make much sense. I realised the purpose of your enquiry, but thought it might be instructive to other readers to know that your scenario was unlikely for more than one reason. PS: Put the Latin up on the Forum and let us have a go! Mr. Green, I'm sorry I misunderstood your intent, though I wonder how many recognized the reference to the warming pan. 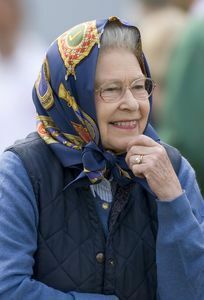 Nice informal picture of Her Majesty. The ring could be photoshopped, I ain't buyin' it just yet. I tend to agree with Prince Philip when he expressed his displeasure at his children not bearing his surname. If I was willing to deny a coa I certainly wouldn't bother with something as trivial as a wedding ring. See Mr. McCartney, you forced to do my own research and look what happened. Now getting past apologies and my feeble attempts at jocularity. I was going type in the Latin I would like translated, but there are abbreviations I can't reproduce on my keyboard. Since I'm basically computer illiterate my only recourse is to tell anyone interested it can be found in the visitations of Shropshire 1623 vol. 28 pg. 149 titled Cotes of Woodcote. I have an interest in this because I am friends with both a Cotes and a Coates who share an armigerous ancestor and we have wondered how a certain Cotes family ended up with the same arms as another different family and this might at least be a partial explanation. If anyone looks at the page, read the note at the bottom of pg.149. If any of you could, maybe you might post the page in the forum and offer a translation. I would greatly appreciate any help I could get with this so that I could pass it on to my friends. Happy that my guesswork motivated someone to dig further!